AAR, a global provider of aviation services to commercial airlines, has expanded its AOG customer support in London-Gatwick and Chicago to empower customer operational excellence. The expansion enables AAR to provide instant solutions, including part sales, exchanges and loans supported from a global warehouse network with locations in Chicago (near O’Hare International Airport); Hannover, Germany; Brussels; Singapore; Dubai; and Shanghai. AAR delivers solutions in line with customer requested service through both competitive response times and dispatch times from order to receipt. The AOG team provides world-class support and no customer is too small or big for AAR to accommodate in their time of need. U.S. industrial conglomerate Honeywell International's revenue for the second-quarter 2018, ending June 30, rose 8.3 percent to US$10.92 billion, above a Wall Street estimate of US$10.80 billion. This earned US$2.12 per share for the quarter, a marked increase on analysts’ average forecast of US$2.01. The news saw the company’s share price rise by as much as 4.4 percent to US$153.99 as it raised its 2018 profit forecast for the third time amid increased demand for aircraft parts and services. The company also announced at the end of last week that it had already begun sourcing components from other countries as a countermeasure against rising prices brought about by the tariff war between the world’s two largest economies. President Trump’s imposed tariffs of 25 percent on steel and 10 percent on aluminium from China have had an adverse effect on costs. Honeywell makes engines for Bombardier and Textron business jets, while its aerospace division, which saw sales rise 10 percent to US$4.06 billion for the quarter, makes auxiliary braking systems and additional parts for both Boeing and Airbus single-aisle aircraft. Spatial has been selected by Dynamic Advanced Training (Dynamic) to provide six state-of-the-art cabin simulation devices as part of Dynamic’s inaugural training academy in Dubai. Due to launch in early 2019, these devices will represent the leading edge of innovation in cabin training globally. In a world’s first, launching business jet Safety and Emergency Procedure (SEP) training into the 21st century, two realistic multi-platform, full scale business jet Cabin Emergency Evacuation Trainer (CEET) simulators have been commissioned. The delivery will also comprise of wide and narrow body CEET simulators for Boeing and Airbus aircraft. These advanced simulators will feature 6 Degrees of Freedom motion systems with both pre-set and live flight paths, high definition visual system synchronized with motion and sound, with the capability of simulating all normal and emergency situations for both commercial and business jet aircraft types. Determined to be at the forefront of aviation training, a Boeing 787 and Airbus A350 Door Trainer, each with Virtual Reality enhanced slide visuals, will add to the comprehensive list of immersive real-world training experiences. Iridium Communications has announced Rockwell Collins as the newest Iridium Certus service provider for the aviation industry. 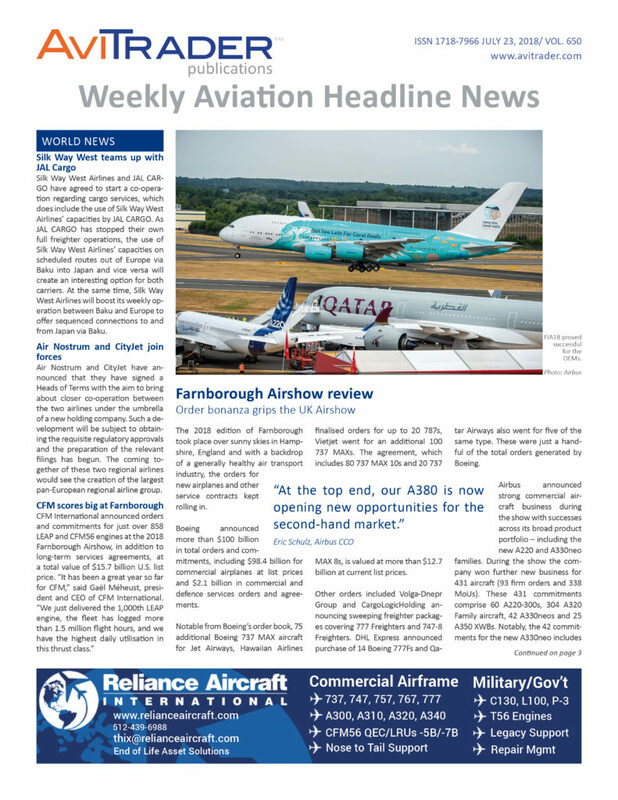 Rockwell Collins will be adding the service to its comprehensive suite of aircraft connectivity applications for commercial, government and ARINCDirectSM business customers. In addition to being a service provider, Rockwell Collins is also a value added manufacturer (VAM) for the design and production of Iridium Certus terminals. As a VAM and a service provider, Rockwell Collins will play a critical role in delivering the next-generation L-band broadband solution to customers around the world. Iridium Certus will bring broadband functionality, with enterprise-grade quality of service, to the aviation industry no matter where in the world an aircraft may fly. The service will soon deliver the fastest L-band broadband speeds on the market at a competitive price with industry-leading small form factor antennas and terminals. The Iridium Certus high-gain antenna (HGA) solutions will provide data speed options of up to 704 Kbps, and eventually as high as approximately 1.4 Mbps following full Iridium® NEXT deployment, with an antenna size of approximately 24 x 10 x 6cm, while the low-gain antenna (LGA) solutions will enable data speeds of up to 176 Kbps. Falko, a market leading aircraft operating leasing and asset management company focused on the regional aircraft sector, has completed the purchase of two ATR 72-500 aircraft from existing portfolio customer Air Austral. The aircraft, MSNs 650 and 813 have been immediately leased back to Air Austral in a sale and leaseback transaction. Magnetic MRO, global total technical care and asset management organisation, successfully completed a VVIP Business Jet repaint project for an undisclosed customer, once again proving itself in the VIP arena by painting a Bombardier Global 5000. “We approach every single paint project as a distinctive artwork as they all need a special attention and require customized solutions. 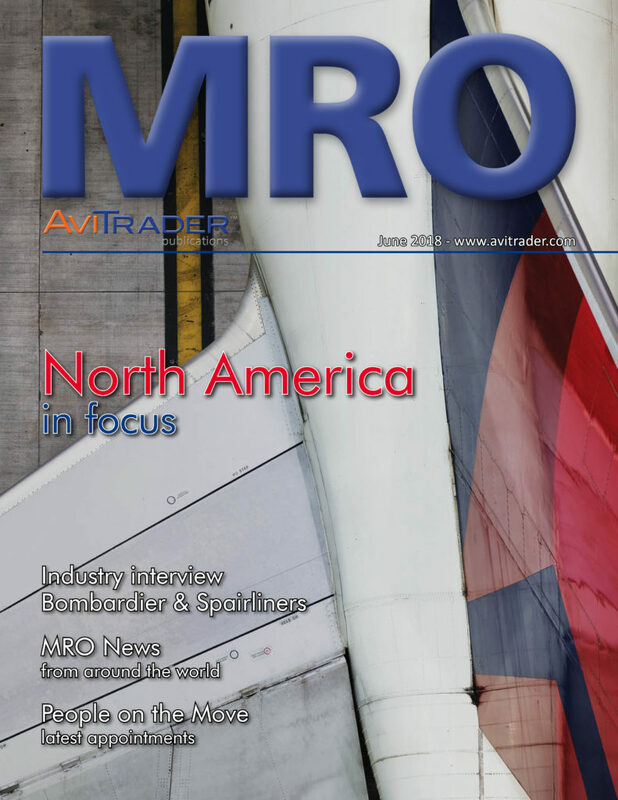 However, painting a business jet, regardless of how exciting it is, refers to a totally different category due to excessive quality demands and required meticulous attention.” stated Rihards Priedkalns, Magnetic MRO Aircraft Paintshop Manager. The project involved 20 painters who dedicated 3450 man-hours and used 550 liters of primers, paints and clearcoats to provide a distinctive result. Priedkalns underlined that the preparation period is the key to deliver a quality result for every project. Following the completion, Painting Department polished every square meter not only to increase the aircraft’s lifetime but also to sustain the quality of the painting. Honeywell has been selected by Allegiant Air to provide maintenance, repair and overhaul services for its auxiliary power units and select avionics components across its fleet of new Airbus A319 and A320 aircraft. The agreement also includes the replacement of non-Honeywell auxiliary power units (APUs) with Honeywell's 131-9A version, ensuring commonality across the Allegiant fleet.